The 24-year-old righty has made two starts so far this season and I watched his start from the 5th because of a better camera angle. 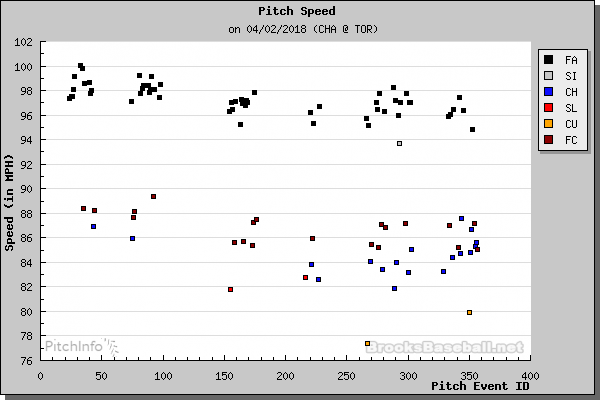 Since it was his first game, the Gameday’s pitch labeling was off with his slider and splitter getting mislabeled quite a bit. • Fastball: 91-95 mph. Fairly straight pitch with a small bit of glove-side run and sink. His plus controls made this pitch play up. Also, he may have mixed in a handful of four-seamers. • Splitter: 84-86 mph and was nasty with a 12-6 sinking motion. The problem is that sometimes it didn’t sink and it got crushed. • Slider: Comes in at 85-89 mph. This pitch looks untouchable to down-right horrible depending on how much it breaks. I’m not sure if the lack of movement is intentional or not but it does break more at lower velocities. When he throws it hard, it seems to straighten out. • He has plus command-and-control of his pitches, especially his fastball. He challenges hitters near the strike zone’s edge and has always had a walk rate near 1.0 BB/9 in the minors. • He’ll likely post a decent groundball rate as all of his pitches have some downward action. Over the past few seasons, his overall groundball rate has hovered just over 50%. Note: I try to stay away from looking too much at a pitcher’s scouting report before doing this report but afterward noticed Baseball America graded him as a 40-grade pitcher with no listed fastball velocity. MLB.com had him at 45 overall with the following grades: Fastball:55, Slider: 55, Change: 50, Control: 60. How in the hell is average to plus on his grades but below average overall? Something is wrong with his evaluation. Overall: He got major-league talent. His fastball is average with two above average breakers and plus control. I had problems coming up with comparable control pitchers for him. I think he’ll strikeout more hitters than Mike Leake but probably less than Zack Greinke. Maybe someone like Jeff Samardzija or Jordan Zimmerman from five years ago. These comps place him as top-30 pitcher and a must own. I settled for Lopez as I wanted to look at several other pitchers but the game’s camera angles were worse. The reason for the look is the 24-year-old righty added slider. • Fastball: 94-99 mph. He has no control of this pitch. He’s just reaching back and launching it. Additionally, he hasn’t been able to keep his velocity up over the games. Eyeballing it, he loses about 3 to 4 mph per game which could lead to late-inning struggles. • Slider: 84-88 mph which was effective going mainly down with some glove side run. It can break completely horizontal or 12-to-6. He’s confident enough with it to throw it for strikes. • Changeup: 84-86 mph which breaks down and to his release side. • Curveball: 76-81 mph and with 12-6 movement. It’s a pretty nasty pitch. • His three non-fastballs are break down and could generate a good number of groundballs. His four-seamer will generate a good number of pop-ups. Overall, he should generate a decent amount of weak contact but it won’t show up in his overall groundball rate which will look average. • He’s a thrower and has some Rich Hill in him where he seems to be able to control his breaking pitches better than his fastball. Overall, I’m in and believe he should be owned in most leagues. The walks will be an issue and I’m a little worried about his late velocity drop. I’m afraid to drop this comp but he reminds of Max Scherzer in his first couple of seasons. Talented but hasn’t put it all together. I’m not sure Lopez will get it togeher but I’ll take the chance. We hoped you liked reading Quick Look: Chirinos & Lopez by Jeff Zimmerman!